Our website is a well visited resource for consumers, visitors, and neighboring communities making it a great place to share business and event information. Our website is a well visited resource for consumers, visitors, and neighboring communities. MACC appears toward the top of any search results regarding Mahomet, Businesses, Events, and more. We update the Chamber website regularly – It’s a great place to visit in order to stay current, but also to share your current information. 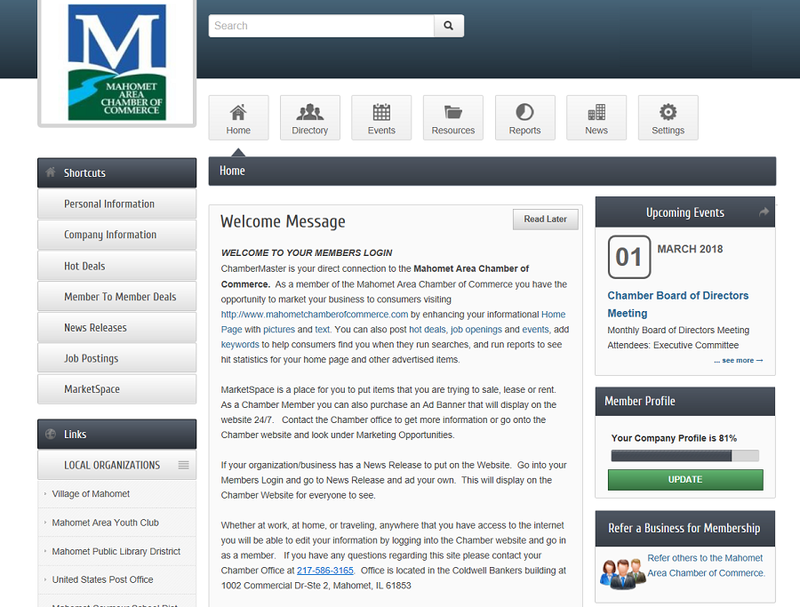 Maximize exposure and visibility by utilizing a Members Login and Password that allows you to easily build your own home page on the MACC site, set up various links including a link to your website, share offerings, promotions, and general information about your business including a map, services, hours of operation, and even social media links (Facebook, LinkedIn, Instagram) with fellow Chamber Members and Visitors. Call the Chamber Office for assistance. Login and Password: These can be assigned to you and when you login you can change them by going to the Login/Password section. The Chamber Office will have record of your information in case you forget it. Business Categories and Keywords: Select these to prompt your business to appear when a visitor is looking for services that match your criteria. For instance, if you are a restaurant but you haven’t checked the category ‘restaurant’ in your membership info, your business will not appear under that category as an option when a visitor is searching for a local restaurant. Job Postings: Post employment opportunities within your establishment so that both visitors and Chamber Members will be aware and may be able to provide you with a candidate. Calendar of Meeting and Events: Add your events to the MACC community calendar. This will keep the community up to date about upcoming events in your business. Hot Deals: Offer discounts, giveaways, make a coupon, or promote Real Estate. Change your Hot Deal regularly to get consumers coming back to see what you are offering. Let your staff know! News Release: Place your own New Release about your business, employees, event and promotion that pertains to your business. Let the public know, it will be published on the Home Page under News Releases. Note: Most public changes (IE Calendar, Hot deals, Market Place, News Releases) will be approved by the Chamber office before going live. Offer discounts, giveaways, make a coupon, or promote Real Estate. Post employment opportunities within your establishment to notify the community. Add your events to the MACC community calendar to keep the community up to date.